No fewer than 12 persons lost their lives while eight others were injured when a Ford commercial bus collided with a Volvo truck along the Lagos-Ibadan Expressway on Saturday. The accident occurred around 12.25pm at the Fidiwo/Ogunmakin area, close to the Foursquare Church camp where traffic was diverted to a single lane due to the ongoing construction in the area. An 18-seater commercial bus, with number plate AAA 886 XR, was travelling to Ibadan, while the Volvo truck (LSD 138 XQ) was on its way to Lagos. According to the Public Relations Officer, Ogun State Traffic Compliance and Enforcement Corps, Babatunde Akinbiyi, the accident was due to wrongful overtaking on the part of the driver of the commercial bus. Akinbiyi said the 12 passengers that died were inside the commercial bus. 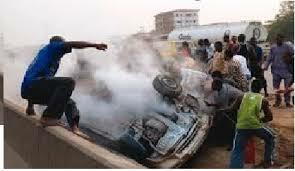 “The accident led to the deaths of 12 persons while eight others sustained varying degrees of injuries. Among the eight, who were injured, six were passengers on the ill-fated bus, while the remaining two were inside the Volvo truck,” he added. He said the corpses of the victims had been deposited at a private mortuary at Ipara, while the injured were receiving treatment in a private hospital at Ogunmakin in Ogun State. The Ogun State Sector Commander of the Federal Road Safety Corps, Clement Oladele, also confirmed the accident and the number of the victims. 0 Response to "12 Die, Eight Injured In Ogun Auto Crash"